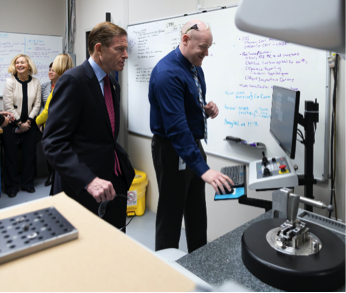 Senator Richard Blumenthal was a welcome visitor to Pietro Rosa Group’s NEAP facility in Connecticut. The visit gave the staff at NEAP the opportunity to explain to the Senator and invited guests the tremendous flight path of growth the company has had since its acquisition on January 1st, 2016. The company has seen a workforce increase by an astonishing additional 130 people and is continuing to grow rapidly thanks to long term contracts with major OEM’s who have embraced the fresh start of the company. The Senator and executive guests from the DECD, the Town of Farmington and Simsbury bank all bore witness to the high volume manufacturing capabilities and the latest inspection techniques that the company uses. James Parkinson, (pictured right) NEAPs Metrology Manager explains measuring techniques used at the facility. During the visit, the Senator chatted to members of the workforce throughout the tour. He witnessed various machining techniques used by the company and the evolution if CMM (Co-ordinate Measuring Machine) methods that were explained to him. At the close of the visit he held an extremely interactive ‘town hall’ forum. The Senator spoke enthusiastically about the Aerospace industry in Connecticut giving inspirational advice to the attendees who gave the Senator a series of great questions that opened up some great discussion on the points raised. The discussions spanned a range of topics from education and taxation through to long-term career prospects in the Aerospace industry. The occasion was marked by a trophy dedicated to the event and an open invitation to visit again our rapidly evolving and expanding Connecticut plant or indeed any of the Pietro Rosa TBM plants in Italy. The group invests heavily in R&D and innovation and has built up its intellectual property in hot forming, machining and surface finishing technologies through a solid collaboration with universities and research center globally.